On 12 May 2018, a 21-year-old Chechnya-born French citizen, armed with a knife, killed one pedestrian and injured several more near the Palais Garnier, the opera house in Paris, France, before being fatally shot by police. The knifings were in the area of Rue Saint-Augustin and Passage Choiseul. French President Emmanuel Macron said France had "paid once again the price of blood but will not cede an inch to the enemies of freedom." The suspect, identified as Khamzat Azimov, had been on a counter-terrorism watchlist since 2016. Amaq News Agency posted a video of a hooded person pledging allegiance to Islamic State of Iraq and the Levant (ISIL) leader Abu Bakr al-Baghdadi, claimed to be the attacker. Europol classified the attack as jihadist terrorism. Paris police cordon off area following the attack. 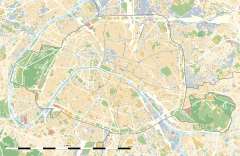 The attack occurred at around 8:47 p.m., in the second arrondissement of Paris. Police first tried twice to stop the attacker with a stun-gun before shooting the suspect fatally when the stun-gun failed to incapacitate him. Footage from the scene shows people running northward from Rue Mehul into Rue Marsollier, and at least one individual on the corner of the streets potentially wounded. An unnamed witness was interviewed by France's BFM network, who stated that a young woman at the entrance of a restaurant was knifed in the neck, before being rescued, and the attacker moved to another street. The attack was put under investigation of a counter-terrorism unit of the Paris Police Prefecture. The pro-ISIL Amaq News Agency claimed the suspect as a "soldier of the Islamic State", responding to its call to attack coalition citizens. Prosecutor Francois Molins stated that the attacker shouted "Allahu Akbar" during the attack. The suspect was named as Khamzat Azimov, a French citizen and nursing student, born in 1997 in Chechnya. He came with his parents to France in the early 2000s where the family was granted refugee status in 2004. Growing up in Strasbourg, in the Region of Alsace, in 2010 his mother became a French citizen, which allowed him to be naturalized also. The then-19-year-old suspect became a person of interest for the DGSI in 2016, when some of his acquaintances planned to travel to Syria. He had no previous criminal record, however, NBC reported that the "suspect was on a police watch list for radicalism." A judicial source told French media that his parents were being held for questioning. In Chechnya, security forces deployed armored personnel carriers in Argun to round up relatives of Azimov for questioning. A high-school friend of Azimov was arrested in Strasbourg and transferred to Paris. Shortly before the attack, he had sent his sister a text message of "a jihadist chant regularly used by the Islamic State" from one of his at least eight cellphones. The suspect, identified as Abdul Hakim A, also a Chechen-born French national who had appeared on terror watch lists, was charged with "associating with criminal terrorists with plans to attack people." Two women were detained for questioning, one reportedly Hakim A's radicalised wife who in 2017 had attempted to leave for Syria. Paris Mayor Anne Hidalgo wrote on Twitter about the attack that "tonight, our city has been bruised" and that "all Parisians are by their side", referring to the families and friends of the victims. French President Emmanuel Macron categorized the attacker a "terrorist". French Interior Minister Gérard Collomb praised the cool and quick response of the French police who "neutralized" the assailant. President of the Chechen Republic, Ramzan Kadyrov, blamed French authorities and his upbringing in France for the attack, declaring that "In this light, I see fit to declare that all responsibility for the fact that Azimov has embarked on the criminal path rests with the French authorities." This caused French Foreign Minister Jean-Yves Le Drian to respond by blaming it on "extrajudicial crackdowns against Chechen civilians" by Kadyrov's security forces. ^ "Police question parents, friend of Chechnya-born Paris attacker". CBC. May 13, 2018. Retrieved May 14, 2018. ^ "Man shot by police in Paris after attacking pedestrians with a knife". CNBC. May 12, 2018. Retrieved May 12, 2018. ^ a b "Paris stabbing leaves 1 dead, 4 injured; suspect fatally shot by police". CBS News. May 12, 2018. Retrieved May 13, 2018. ^ a b "Paris attack latest: Isis claims responsibility for multiple stabbing in Opera district". The Independent. 13 May 2018. ^ "Khamzat Azimov: Who is the Paris attacker responsible for stabbing five people, killing one?". The Independent. 14 May 2018. ^ "Terrorist threat in the EU remains high despite the decline of IS in Iraq and Syria". Europol. Retrieved 2018-06-25. ^ a b "Terrorism probe into Paris knife attack that left two dead, including attacker". ABC News. May 13, 2018. Retrieved May 13, 2018. ^ "Two dead in Paris knife attack". BBC News. 12 May 2018. Retrieved 12 May 2018. ^ a b Hayes, Christal; Bhatti, Jabeen (12 May 2018). "'Our city has been bruised': Islamic State claims Paris knife attack that left 1 dead, 4 injured". USA TODAY. Retrieved 13 May 2018. ^ "French police say suspected Paris attacker of Chechnyan origin". France24. AFP. 12 May 2018. ^ "Paris Attack Leaves 1 Dead and 4 Wounded by Knife-Wielding Terrorist". The New York Times. 12 May 2018. ^ Steve Almasy; Eva Tapiero (13 May 2018). "Attacker yells 'Allahu Akbar,' stabs five in Paris before police take him down". CNN. Retrieved 15 May 2018. The person who stabbed five people in Paris on Saturday night, killing one, yelled the Arabic phrase "Allahu Akbar," meaning "God is great," during the attack, city prosecutor François Molins told reporters at the scene. ^ "French government says attack foiled, Egyptian man arrested". The Washington Post. 18 May 2018. ^ "Qui est Khamzat Azimov, l'auteur de l'attentat au couteau qui a fait un mort à Paris ?". Le Monde (in French). 2018-05-13. Retrieved 2018-05-13. ^ Angela Charlton; Elaine Ganley (13 May 2018). "Dead Paris knife attacker's parents and friend questioned by French police to uncover motive for stabbings". National Post. Retrieved 15 May 2018. The suspect was on a police watch list for radicalism, a judicial official not authorized to speak publicly about the case told The Associated Press. ^ "Paris attack suspect 'of Chechen origin'". BBC News. 2018-05-13. Retrieved 2018-05-13. ^ a b c d "From Child Refugee To Alleged IS 'Soldier'-- A Closer Look At Khamzat Azimov". RFE/RL. 15 May 2018. ^ a b "Paris knife attack: Friend of jihadist charged and two women arrested". The Local. AFP. 18 May 2018. ^ Paulina Dedaj; Amy Lieu (14 May 2018). "Suspect in deadly Paris knife attack was native of Chechnya, official says". Fox News. Retrieved 15 May 2018. In a tweet sharing his condolences for the victims, French President Emmanuel Macron labeled the attacker a "terrorist." ^ ELAINE GANLEY; ANGELA CHARLTON (13 May 2018). "Paris stabbings investigated as terror attack, claimed by IS". Los Angeles Times. Retrieved 15 May 2018. President Emmanuel Macron tweeted his praise for police who "neutralized the terrorist"
^ Almasy, Steve; Tapiero, Eva (12 May 2018). "Attacker stabs five in Paris, killing one before police take him down". CNN. Retrieved 13 May 2018.